There’s no getting away from the threat of cybercrime today, and corporations are feeling the bite more than most. It’s estimated that by 2021 businesses will be absorbing $6 trillion annually in costs incurred from cybercrime, with another $1 trillion in defensive spending accumulating over the same period. This threat, and the need to defend against it, is driving a new and unprecedented wave of demand in the business world for managers and senior executives with technical knowledge and security skills on par with their business acumen. It’s exactly this combination of knowledge and skills that you are getting when you get an MBA with a concentration in cybersecurity from an accredited business school. With projections suggesting there will be some 3.5 million unfilled cybersecurity positions by 2021, that particular skillset represents a demand that is not being fulfilled… and this means big paychecks for the few who can bring that combination of skills to the ring. People like you. There’s no easy path to earning an MBA. That goes double for one with a cybersecurity concentration, a new specialization in a very old field of study. An MBA from a top school can run well into six figures and even more affordable options will make a big dent in your bank account and take a year or more to earn. This combination of time and cost and a new field of study makes choosing the right program particularly important. Getting the best education for your money is a big deal, but so is finding a program that offers legitimate insight and up-to-date techniques in a constantly changing field like cybersecurity. It’s a big challenge to find programs that can meet both those goals. One way to cut out a lot of the options that aren’t worth your time is to look at their accreditation status. Although any university worthy of the name has a general accreditation that already looks at such elements, these specialty accreditors evaluate them from a strictly business perspective, ensuring they meet the standards of employers operating in the real world. Although accreditation is a big step toward validating the business aspects of an MBA program, weighing the quality of the cybersecurity concentration track requires a separate approach. Technology itself is a highly specialized and fast-changing field that requires dedicated instructors and an up-to-date curriculum. And information security is even more specialized. We focused on picking programs for the list from schools that also have some notable cybersecurity research or teaching credentials apart from the business school. Schools with cybersecurity studies institutes or that are named among the joint NSA/DHS Cybersecurity Centers of Academic Excellence (CAE) were a shoe-in for their cutting edge, nationally recognized security programs, for instance. Of course, we didn’t neglect taking a second look at the business skills taught by the program, either. An MBA is an MBA, after all… the advantages you offer to potential employers hinge on not just your cybersecurity skills, but your ability to integrate those skills with contemporary business practices and requirements. So we made sure every program on the list has a solid core of accounting, marketing, strategic planning, and human resources courses, all the basic elements of a high-quality business management education. We also made sure that every program has at least some online course offerings, and deliver those courses with the kind deftness you’d expect from a program with a technology component. This particularly important for cybersecurity specializations, not just because of the freedom and flexibility that online classes offer you, but also because it’s a solid indication that the school is actually qualified to be teaching information technology topics. You don’t go to an auto mechanic that doesn’t change his own oil; you don’t want to pick a cybersecurity specialization that doesn’t maintain its own network integrity. Finally, we looked for the little extras… schools that go out of their way to make things a little easier, or offer a little more realistic training, or have better connections in the industry. If a school offered courses that meet industry-recognized information security certification requirements, we gave them a little more weight; if they have student or professional groups that offer more networking or study opportunities, we noticed that too. Schools that have good industry connections and offer real-world, experiential learning opportunities are particularly favored here. There is no coursework in the world that can keep up with the evolution of real-world cyberthreats, so genuine practice in the field is the gold standard for getting the cybersecurity specialization training that employers are desperate for today. We can’t tell you which online MBA in cybersecurity is the best bet for you, but we can tell you that you’ll be able to find it here on this list. Explore these options and make your selection with confidence; every program shown here has earned its place among the very best in the nation. A Villanova MBA cybersecurity specialization will teach you to identify the scope and nature of cyber threats and devise strategies and techniques to thwart attacks and compromises. You’ll learn current and past best practices in order to slot your assessments into a wider picture than most security professionals enjoy. Informed by your core courses in business strategy, finance, and team leadership, you’ll be equipped to put together a first-rate cybersecurity team and lead them up against the worst threats the internet can throw at you. Florida Institute of Technology’s MBA in Cybersecurity is everything you’d want in an MBA. It’s focused on the technical and managerial skills needed to succeed in the 21stcentury…It’s staffed with a faculty who bring real-world experience to the classroom…And it allows emerging professionals like you to think critically, solve complex problems, and effectively collaborate with like-minded peers. This innovative course of study, which can be completed in just two years, is designed to provide you with the skills you need to meet the challenges of today’s enterprise security needs. While this program is offered fully online, you’ll still study in a unique, collaborative environment that features hands-on learning and a robust curriculum that includes class lectures, mentoring, and valuable interactions with business leaders and entrepreneurs. Want to take your MBA to the next level? Consider adding a study abroad experience in places like Spain, Netherlands, and Oxford, England. You can also complement your degree with participation in intercollegiate competitions like the Business Hackathon, which brings together students who work in teams to produce innovative solutions to complex business, energy, healthcare, and technology problems. Saint Leo University’s MBA in Cybersecurity Management is a fully online course of study that’s designed to prepare adult learners like you with the technical skills and business knowledge needed to deal with the threats of cybersecurity in today’s dynamic and vulnerable business world. In addition to arming you with a broad background in business through courses related to business communication, ethics, and leadership, you’ll dive deep into topics like network security management, systems security management, and strategic planning for cybersecurity. You’ll complete one-two courses per eight-week term, graduating in as little as a year! You’ll also have the option of choosing a dual concentration, if desired, to further specialize your MBA. As an online student, you’ll also have the option of pursuing a variety of professional development opportunities, including presenting at a national conference, completing an internship, or joining a professional membership. There is a definite focus on security work to the USF MBA program. In addition to the cybersecurity concentration, the school offers a highly specialized anti-money laundering option. Even the data analytics specialization incorporates accounting analysis courses that could be applied to information security practices. All this means that instructors at USF offer the one thing that you can’t get in a basic information security class: the mindset of a security professional. Knowing the techniques and the technology are only half the battle in information security, and USF instructors can help you develop the other half… the ability to think like a hacker or criminal. You’ll learn how to view corporate and cyber operations through an entirely different lens that will help you spot the holes and defend companies against the pervasive threats around the internet today. By the time you’re finished studying the University of West Florida’s Information Security emphasis, you’ll have a broad understanding of architectural aspects of cybersecurity and an ability to construct the right policies and procedures to protect any corporation’s information assets. You’ll also get important aspects of information assurance programs dealing with ethics, something that many programs barely touch on. By the time you complete the program, you’ll have a complete set of tools for evaluating and building out information security schemes and functioning as an effective executive leader in cybersecurity organizations. The IA concentration to the Louisiana Tech MBA program offers a highly distinctive experience that puts business acumen and cybersecurity skills side by side. The curriculum follows National Security Agency guidelines and incorporates additional coursework in specific analytical skills that can help graduates suss out system compromises from a variety of angles… financial, electronic, or operational. The Tech program prides itself on offering programs that are tailored to fit your individual career and life goals, but without compromising the high level of expertise and knowledge that you deserve in such a cutting-edge field. Communication; leadership; technical and leadership skills. These are qualities that every MBA program offers and the Lawrence Tech MBA is no different. What makes the cybersecurity concentration for the Lawrence Tech MBA different is the industry partnerships and project-based curriculum that puts you to work on genuine information security issues on tight-knit teams composed of both current industry professionals, fellow students, and instructors with bleeding-edge credentials straight from the workplace. This team-focused approach is built on top of a solid technology curriculum that doesn’t fast-forward right into complex cybersecurity topics. Instead, a mandatory course covering enterprise network architecture gives you a ground-level understanding of the systems in contention before you branch off into electives in advanced network security, disaster recovery, and security controls. After graduation, you’ll be the most formidable kind of business executive: one with an intimate understanding of both business processes and information security protocols. As Montana’s only MBA program, you might imagine that UM’s program skates a little bit, offering the bare minimum to a captive audience. But you would be wrong; with a handful of unique certificate options, flexible attendance offerings, and individualized student support through the Gianchetta Student Success Center, UM goes the extra mile to engage and educate high-caliber MBA candidates. The cybersecurity certificate option delivers high-tech expertise in modern security principles and practices alongside project management, financial analysis, and marketing acumen that will make you a perfect fit in any modern enterprise. Bellevue University understands the complexities of today’s technologically advanced business world, which is why they offer the innovative MBA in Cybersecurity, a practical, relevant degree for working professionals like you. This fully online degree, which emphasizes the practice of real world skills, pairs you with like-minded business associates who bring their unique perspectives to the classroom. Add to that a faculty of esteemed instructors who bring their real-world business and industry expertise to the classroom through simulations and case studies and it’s easy to see why Bellevue University’s MBA in Cybersecurity primes emerging professionals like you for success beyond the classroom. This program features a robust curriculum designed to prime you to prevent, detect, deter, and respond to real and potential cyber threats and incidents. Just some of the topics of study include security architecture and design, computer forensics, penetration testing, and information warfare. 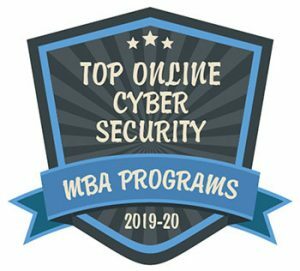 Complete the MBA in Cybersecurity through Bellevue through its fully online course delivery and you’ll benefit from interactive and collaborative online forums…videos, tutorials, and online tutoring…and 24/7 tech support. Utica College has historically strong information technology programs and criminal justice and security degrees. So it makes perfect sense that their cybersecurity concentration in the master of business administration program would be one of the best in the country. The real-world experience of instructors and many of the students lends a highly practical aspect to the concentration. Because of the school’s strong criminal justice and security background, you’ll also get a much more intensive exposure to cyber threats intelligence angles and the national security and infrastructure aspects of cybersecurity than most programs can offer. Combined with a beefy, practical course of instruction in business fundamentals, you’ll get a terrific setup for success in either governmental or corporate cybersecurity roles working in either prevention or incident investigation. Salve Regina University’s MBA in Cybersecurity Issues in Business features a highly adaptable program that can be completed entirely online for busy, working professionals like you. With a foundation of study in entrepreneurship, ethics, organizational behavior, finance, economics, accounting, and strategic management, the MBA in Cybersecurity Issues in Business prepares emerging leaders with a robust and rigorous course of study that’s focused on addressing the cyber threats that face many organizations. You’ll benefit not just from this program’s outstanding curriculum that includes topics like cyberthreat management, analytic methods, and the management of cyber opportunities and threats, but also from the outstanding faculty, who serve not just as instructors but as mentors. Complete your MBA here and you’ll have access to the university’s Pell Center, which focuses on contemporary research, such as organizations’ cyber preparedness levels. They like to do things big down in Texas, and as the largest online MBA program in the state, you know that the A&M-Commerce MBA is a pretty big deal. With high-technology in the state booming the way the oil industry did in the last century, businesses in the largest state are scrambling for executive talent that has a strong command of the intricacies of cybersecurity. A Cyber Security Minor with your MBA is exactly the way to demonstrate your fitness for those roles. IT auditing, database management, mobile security intelligence, and cyber forensics all fill out the specialization courses you’ll take on top of the already intensive business strategy and accounting layer in the core MBA curriculum. A flexible curriculum structure and polished online learning system make it easy to get the mechanics of classes out of your way and just focus on the course content. As one of the fastest growing schools in the University of Texas system, UT-Tyler has an edge in keeping up with trending topics. Cybersecurity is a big one; huge demand in corporations for cyber-savvy executives has led to a dynamic, constantly updated program led by top faculty who keep their fingers on the pulse of the latest security trends and techniques. Those include cryptography and network protocols, where you are exposed to technology at a level that most executives can’t manage. But with the ground-level understanding of cybersecurity you’ll get at UT-Tyler, you’ll be the person to turn to when it’s time to devise security policies, disaster recovery systems, and to evaluate outside connections and partnerships that can make or break a modern business. Although the courses have in-depth knowledge, they are designed to accommodate future executives from any type of background. Visionary careers in a global business environment are what the DBU MBA program seeks to prepare you for, but there are some dark clouds at the edges of that vision. Global business means global connectivity, and global connectivity today makes for unprecedented vulnerability to raging cyberattacks from every corner of the world. The business community is crying out for executives prepared to defend corporate networks against this onslaught, and that’s exactly what the IT Security for Managers concentration does for you at DBU. After a solid introduction to core business principles such as finance, leadership, and analysis, you’ll wade into twelve hours of deep security training. Policy and governance development and guidance, security program management and development, and risk management will all help build your portfolio for dealing with the constant and evolving cybersecurity threat out in the real world. The Goddard school puts its money where its mouth is when it comes to ethical leadership; The Giving Project sees MBA students contributing $3,000 as part of a strategic leadership project for three regional non-profit organizations. It might not have much to do with information security, but it has everything to do with effective and trustworthy leadership qualities. Those are qualities Goddard seeks to instill to produce stakeholder-focused MBA graduates. And they are important when you earn your certification in IS&T/IA, because stakeholder considerations are vital in information security circles. With insider compromises forming the majority of all security breaches, and internal compliance failures many of the rest, understanding your organization and your staff is just as important as knowing about the latest tools for data storage, collection, and security. At Goddard, you’ll get all of the above. Graduates go on to work for some of the most high-tech organizations in the business world today, putting skills to use against real threats. Most MBA programs that offer a concentration in cybersecurity put you through the same core curriculum as any other MBA student and take on two or three courses that teach you some buzzwords that will sound good in a conference room when you’re talking with amateurs and clueless CEOs. James Madison, however, puts you right down into the gritty details of information security right from the start. The entire program curriculum is built around security issues. While it doesn’t shy away from all the traditional business aspects that any MBA program will teach you, it presents them all in the context of cybersecurity considerations… the effects of economics, ethics, and cultural awareness on security concerns. With key industry partnerships with top cyberdefense educators and consultants, you get every opportunity to learn from some of the best in the business while studying some of the most pertinent real-world threats roaming the internet today. Lynchburg’s cybersecurity emphasis is unusual in that it starts off much more firmly rooted in fundamentals than other cybersecurity programs: a basic education in the roots of information technology. While the concentration hits all the right points on cybersecurity and computer forensic subjects, where it starts is with the basic knowledge that helps you make sense of what makes those tools necessary and effective. That’s means courses in systems and distributed systems architecture and administration, and general information technology management. It’s not quite a dual emphasis in IT management and security, but it’s pretty close! With strong conventional business courses in accounting, finance, marketing, and other business-centric instruction, you will walk away from Lynchburg’s MBA program with all the right tools to step into an IT management or security position with confidence and competence.